Step into a sacred culture in the ancient capital of Luang Prabang. In Cambodia, explore the legendary temples of Angkor Wat, an awe-inspiring UNESCO World Heritage site. Experience the bustling city of Hanoi, the mystic waters of the stretching Mekong Delta, the wonders to be found in Hue and the historic capital Ho Chi Minh. Enjoy an overnight river cruise on Halong Bay and the charm of Hoi An. International flights: UK - Luang Prabang, Ho Chi Minh - UK. Bottled mineral water and wet wipes in the car during the tour. ** Half board/Full board available to book in the next step of the booking process. Visas*, drinks, tips and any other services not mentioned in what's included. * Visa for Cambodia and Laos are available on arrival for approx. $35. You will need a passport photo with you. Alternatively, you can apply for a visa in advance at the Laos Embassy in London. Ensure you receive a stamp in your passport when you arrive in Laos. Arrival at UK departure airport ready to check-in for an overnight flight to Luang Prabang. Night on board. Arrive in Luang Prabang, meet your guide and transfer to your hotel. Luang Prabang sits in a valley at the meeting point of both the Mekong and Nam rivers and has a charming French colonial influence and many amazing Buddhist temples. Spend the rest of the day at your leisure. Overnight in Luang Prabang. This morning take part in a very special dawn visit to watch the monks collecting the alms. As the sun begins to rise, long lines of orange-robed monks leave their pagodas and collecting offerings from Luang Prabang residents. It is a beautiful, serene ceremony that highlights the spiritualism of the Laos people. Visit Morning Market where you can fresh local produce. Return to your hotel for breakfast then board a cruise upstream on the Mekong River, for a beautiful view of the tranquil countryside as well as an interesting visit to the mysterious of Pak Ou Caves, crammed with thousands of golden Buddha statues of various shapes and sizes. Return to the town at noon time. In the afternoon, enjoy a city tour and visit the National Museum at the former Royal Palace, which displays a lovely collection of the artefacts reflecting the richness of Lao culture dating from the days of the early kings. Later, explore the Street Night Bazaar, where you can find handmade textiles by local people. Overnight in Luang Prabang. Breakfast at the hotel. After breakfast, drive through the Luang Prabang countryside to Kuang Si Waterfalls. Along the way, witness gorgeous landscapes of many rice fields, hills and villages. You will visit an ethnic minority at a village where their local culture has remained unchanged for centuries. Upon reaching Kuang Si Waterfalls, relax and enjoy the magnificent natural surroundings. Afterwards, return to the Luang Prabang. The remainder of the day is free at leisure for walking around the peaceful town, enjoying a coffee by the Mekong River or pampering yourself with a traditional Lao massage. Overnight in Luang Prabang. Breakfast at the hotel. Today explore the most significant temples in the Angkor Complex. Visit the ancient capital, Angkor Thom and enjoy the unique decorative towers of the Bayon Temple. At Preah Khan Temple, wonder at the 12th-century splendour before you continue to Ta Prohm in the afternoon, home to the enormous iconic fig tree roots that grow through the middle of the temple. Admire Bayon architecture at Bantey Kdei temple before you finally arrive at Angkor Wat, the world heritage site and most revered of all the Cambodian temples. It features the longest bas-relief in the world and is the perfect place to watch the sunset over the entire temple complex. Return to the hotel. Overnight stay in Siem Reap. Breakfast at the hotel. Enjoy a morning at your leisure. We recommend to do the optional excursion to Tonle Sap Lake. * Later, transfer to the airport for your flight to Hanoi. Arrive in Vietnam and transfer to your hotel. Take the opportunity to explore this bustling city and get to know your surroundings. Overnight stay in Hanoi. Breakfast at hotel. Depart by road to Ha Long Bay, a World Heritage area of outstanding natural beauty. Travel through the rich farmlands of the delta and witness daily life of the Vietnamese villages. Arrive in Ha Long and board a traditional junk boat. Lunch on board. The cruise passes by many fascinating islets and may stop for a while to visit The Surprise Cave. Dinner and overnight on board. Brunch on board as the junk continues to cruise before you return to Ha Long port. Disembark and transfer to Hanoi for a flight to Danang. On arrival, you will be met by your guide and then transfer to your hotel in the quaint city of Hoi An. Overnight stay in Hoi An. Breakfast at the hotel. You can walk around the tiny town of Hoi An with the stops at a 400-year-old Japanese Bridge, a 300-year-old Chinese Temple and 200-year-old Vietnamese former merchants' house. Overnight stay Hoi An. Breakfast at the hotel. You will be free in Hoi An until check out. In the afternoon you travel along one of the Vietnam's most scenic highways to Hue. Stop on the way at the white sands of Lang Co Beach and at the top of Hain Van Pass for a panoramic photo opportunity. Arrive and transfer to your hotel in Hue. Overnight stay in Hue. Breakfast at the hotel. Enjoy a full day tour and visit the impressive home of the Nguyen Dynasty emperors, the Imperial City and the Royal Citadel. Much of the Citadel was destroyed during the Tet Offensive but is gradually being restored. Continue by boat on Perfume River to the Thien Mu Pagoda, Hue’s oldest and most beautiful pagoda. Discover the mysterious tombs of King Minh Mang and King Khai Dinh before you return to Hue. Overnight stay in Hue. Breakfast at the hotel. Early transfer to the airport to take a flight to Ho Chi Minh City. Upon arrival, meet your guide and visit the moving War Remnants Museum which presents a partial, but riveting, view of the American War. Continue to the Reunification Palace, the former residence of the Indochina Governor-General and later President of the Republic of Southern Vietnam until the fall of Saigon. The tour finishes with Notre Dame Cathedral and the bustling Ben Thanh Market. Overnight stay in Ho Chi Minh City. Breakfast at the hotel. The day is free at your leisure until being transferred to the airport for your overnight flight back to the UK. Night on board. All flights include 1 luggage 20kg per flight per person. * The internal flight Bangkok - Siem Reap is with AirAsia. 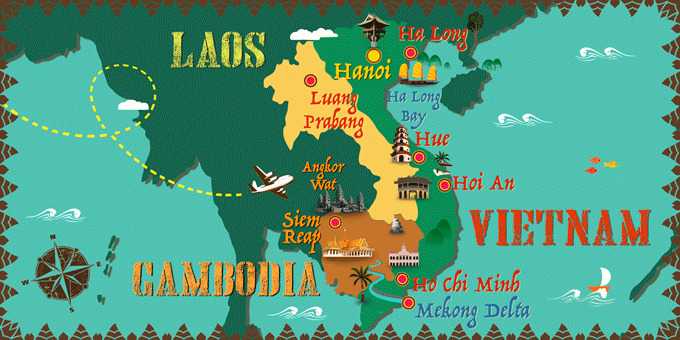 Hanoi - Danang & Hue - Ho Chi Minh are with Vietnam Airlines on all the departure dates. Details of your internal flights will be detailed in your travel documentation, in your Customer Area, nearer to your departure date. * Visa available on arrival for approx. $35. You will need a passport photo with you. Alternatively, you can apply for a visa in advance at the Laos Embassy in London. Ensure you receive a stamp in your passport when you arrive in Laos.